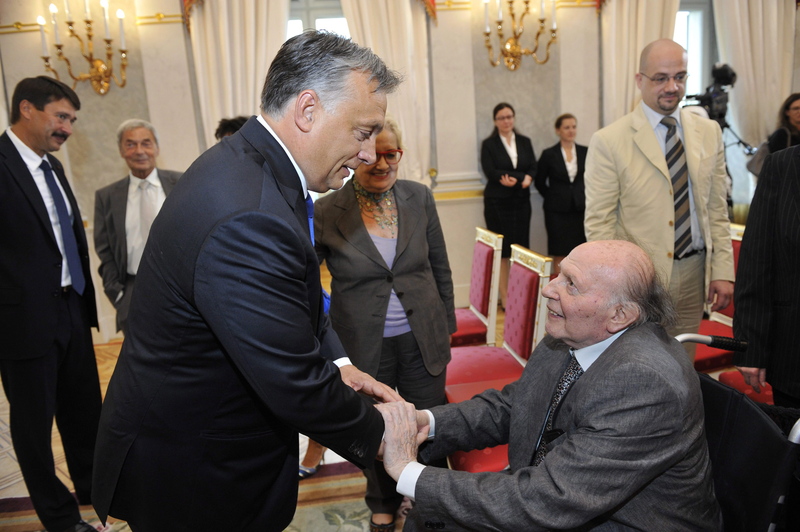 Author Imre Kertész accepts congratulations from Prime Minister Viktor Orbán before receiving an Order of Saint Stephen medal on August 20, 2014. On August 20, 2014, Jewish-Hungarian author Imre Kertész (along with Rubik’s Cube inventor Ernő Rubik) received an Order of Saint Stephen medal—the highest state award in Hungary—in an official ceremony at the presidential Sándor Palace in Budapest. Kertész is the author of the Nobel Prize-winning novel Fatelessness, a semi-autobiographical work based on his experiences at the Auschwitz-Birkenau and Buchenwald concentration camps in 1944–1945. Kertész is regarded as a liberal author in Hungary. The explicitly anti-liberal administration of Prime Minister Viktor Orbán presumably decided to present Kertész with the Order of Saint Stephen in honor of the government-sponsored Holocaust Remembrance Year commemorating the 70th anniversary of the deportation of around 500,000 Jews from Hungary to concentration camps in greater Nazi Germany during the spring and summer of 1944 (see official website in English). Nothing new in this country. The leader who fascinates: today one is in the same situation as during the era of János Kádár. Hungary is enchanted by Orbán like the Pied Piper of Hamelin. This goes back to something very profound. And, with me, to a true doubt. . . . The question that I ask myself is: why does Hungary always go wrong? . . . The current situation is nothing more than an illustration of this propensity for error. The Hungarian state is currently choosing to oppose Europe in the name of defending national interests, which can give the impression of a return to sovereignty. But, once again, this is a mistake. Nothing new. No problem. And no solution because there is no problem. . . . Hungary is an inevitability that has no meaning or explanation and is unique in Europe. Hungarians cling to their destiny. They will no doubt end up failing without understanding why. In a statement released before the ceremony, Kertész said that “the desire and urgent necessity to establish concensus” had prompted him to accept the Order of Saint Stephen award from an administration for which he has expressed nothing but disdain in the past (source in Hungarian). This is the same administration that maintains an official policy of strict opposition to all manifestations of anti-Semitism in Hungary, yet at the same time deflects blame for the mass deportation of Jews from the country in the final year of the Second World War from the Hungarian government onto the Germans both explicitly in the Fundamental Law and implicitly in the symbolism of the recently inaugurated German Occupation Memorial in Budapest. This is the same administration that has accorded official recognition to current journalists such as Zsolt Bayer, Ferenc Szaniszló and Péter Szentmihályi Szabó and past authors such as Cécile Tormay, József Nyirő and Albert Wass who have expressed overt anti-Semitism in their writings. 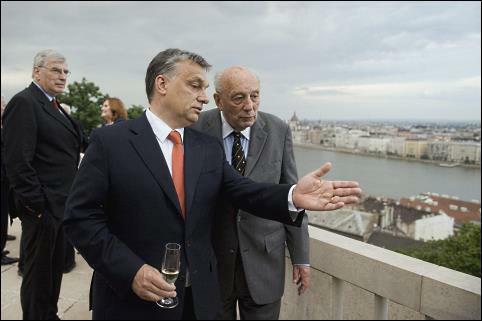 Prime Minister Viktor Orbán and historian John Lukacs look out over the city of Budapest in May 2013. The above actions have prompted U.S. authors and survivors of the Hungarian Holocaust Elie Wiesel and Randolph Braham to return Hungarian state awards. 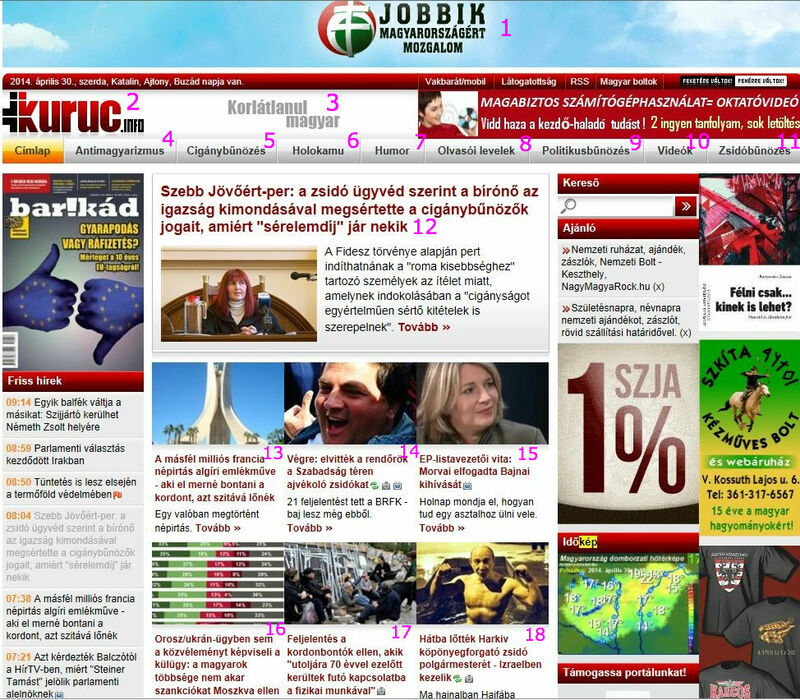 Many left-liberal Hungarians were disappointed that Kertész, who is dying of Parkinson’s Disease, chose to accept the Order of Saint Stephen from the Orbán administration—disillusionment reflected in the title of an editorial published on the opposition website index.hu on August 15: “Imre Kertész has Become the Government’s Holocaust Clown” (source in Hungarian). The primary motive of the Orbán government for honoring Kertész and Lukacs is obvious: to make a show of support for Hungarian intellectuals who have gained high esteem in the liberal-democratic West in order to counterbalance the heavy criticism from that direction of the illiberal, quasi-Putinist system it is building in Hungary. However, one wonders what factors impelled the 84-year-old Kertész and 89-year-old Lukacs to fraternize with the Orbán administration in what were very likely their final public appearances: Yearning? Resignation? Isolation? Degeneration? The fate of very old men to make peace with the world before they leave it? 1-Lukacs did publish an editorial in the opposition newspaper Népszabadság in January 2014 in which he criticized the Orbán government’s rapprochement with Russia (see An Archconservative Speaks Out). Érpatak Mayor Mihály Zoltán Orosz stomps on a modified Israeli flag. On August 2, 2014, de facto Jobbik (de jure independent) Mayor Mihály Zoltán Orosz of Érpatak (eastern Hungary, population 1,700) hanged current Prime Minister Benjamin Netanyahu and former President Shimon Peres of Israel in effigy from gallows erected in front of the village council building. 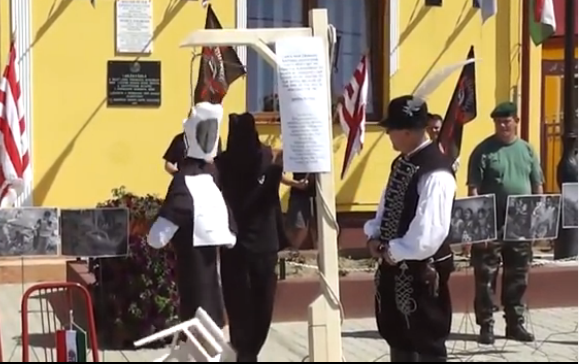 Mayor Orosz conducted the mock executions after ceremonially trampling on an Israeli flag bearing a Masonic Square and Compass in place of the Star of David to protest the “continual holocaust taking place in Palestine,” specifically the hundreds of Palestinians killed during Israel’s military operations in Gaza (video of event in Hungarian). Orosz, who became the mayor of Érpatak in 2010, has become well-known in Hungary for appearing at public events in various types of Hungarian historical costume and for his so-called “Érpatak Model” of maintaining order in the village, which essentially consists of imposing coercive measures on its Gypsy inhabitants in order to compel them to do public work and respect the law (source in Hungarian). Orosz is also a known for his close connection to radical-nationalist organizations such as the New Hungarian Guard, the Outlaw Army (Betyársereg) and the 64 Counties Youth Movement (Hatvannégy Vármegye Ifjúsági Mozgalom) as well as various neo-Nazi Hungarist groups (source in Hungarian). 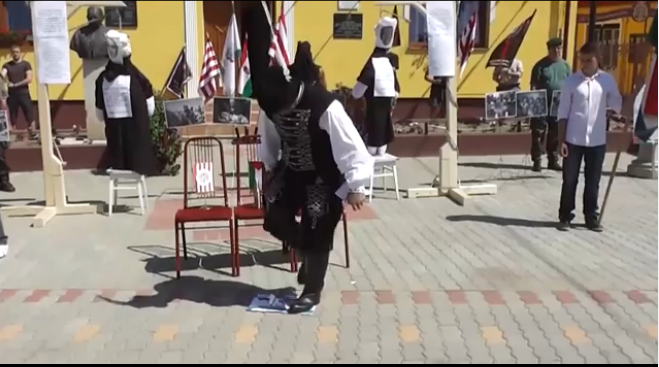 Mayor Orosz watches as the executioner kicks the stool from underneath the effigy of Shimon Peres. During one of his annual public commemorations of the attempt of German and Hungarian military forces to break out of the Soviet siege of Budapest in February 1945, Orosz referred to Second World War fascist Arrow Cross head of state and government Ferenc Szálasi as Hungary’s “martyred national leader” (source in Hungarian). Orosz has also launched an increasing number of high-profile attacks on liberals and manifestations of liberalism in Hungary, most recently making the 200-kilometer trip to Budapest earlier in the summer to heckle participants in the city’s annual gay parade (source in Hungarian). On June 18, 2014, the Nyíregyháza Court of Justice ruled that Orosz had committed an illegal act of political discrimination when he ordered police to remove a local member of the Hungarian Civil Liberties Union from his 2013 commemoration of the 1945 German-Hungarian attempt to escape the Soviet siege of Budapest (source in Hungarian). The hanging in effigy of Israel’s head of government and former head of state that Orosz organized on August 2 may entail further legal proceedings against him: on August 5, Hungary’s Chief Prosecutor’s Office announced that at the request of the Israeli embassy in Budapest it had initiated an investigation of the mayor of Érpatak on suspicion of incitement (source in Hungarian). 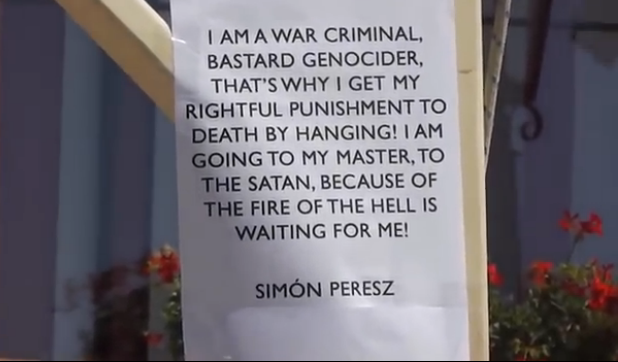 Sign on gallows used to hang the effigy of Shimon Peres. And, for the first time, the Orbán administration condemned Orosz’s antics: on August 4, Minister of External Economy and Foreign Affairs Tibor Navracsics issued a statement in which he declared that “Arbitrary and symbolic administration of justice toward the leaders of other states is incompatible with European norms and rule of law. The mayor is exploiting the innocent victims of the Gaza war as a pretext for disseminating his malicious propaganda“ (source in Hungarian). 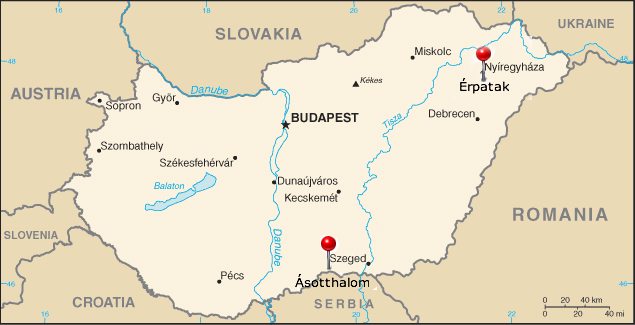 Perhaps the Orbán government will soon decide that it really wants to inhibit the spread of racist radical nationalism in the economically disadvantaged regions of rural eastern and southern Hungary after either ignoring or tacitly encouraging this phenomenon during the 2010–2014 parliamentary cycle. However, Mihály Zoltán Orosz’s ardently anti-liberal, anti-Semitic, anti-West and anti-democratic policies and activities as mayor of Érpatak, the victory of 64 Counties Youth Movement leader László Toroczkai in by-elections for mayor in the village of Ásotthalom in December 2013 (see The First Little Pinprick) and the significant degree of support for the New Hungarian Guard (see Uniform Disorder) and Jobbik (see Crunching the Election Numbers) in these parts of the country suggest that it may be too late. Postscript: a reporter from the opposition weekly Magyar Narancs talked to the man who played the role of executioner in the mock hanging: he reported that Mayor Orosz had enlisted him to do this job as part of his village “social work” duties and that “It doesn’t matter to me who’s shooting who and who they are hanging” (source in Hungarian). Workers complete the German Occupation Memorial early on the morning of July 20 (source: atlatszo.hu). July 20, 2014—about an hour after midnight: a convoy of trucks, police vans and a crane pulls up to the incomplete German Occupation Memorial on Szabadság [Freedom] Square in central Budapest (see What Is Truth?). Workers emerge from the trucks and erect security fence around the perimeter of the memorial and at all points of access to the square as approximately 100 police officers stand guard (source A and B in Hungarian). A few late-night stragglers observe the spectacle from a distance. A couple of them take video on their mobile phones. 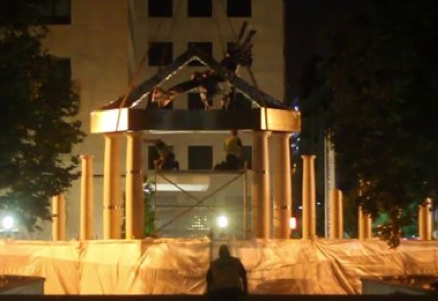 The crane lifts the missing statue elements—a German Imperial Eagle (Reichsadler) representing Hitler’s Third Reich descending upon an Archangel Michael representing Horthy’s Hungary—into place, thus completing the structure that has been standing unfinished for weeks. The next morning the opposition media reports the news in the greatest detail possible, most of them relying on a video published on the website atlatszo.hu. The Hungarian News Agency MTI that serves as the source of news for all Hungary’s state-run television and radio stations makes no mention of the overnight completion of the memorial, reporting only the protest of various opposition parties beginning later in the morning. A group of about 200 demonstrators gathers spontaneously at the newly completed memorial to the victims of Nazi Germany’s occupation of fellow Axis power Hungary in the final year of the Second World War, pelting the statue of Archangel Michael with eggs. The large contingent of police protecting the memorial does not intervene, though initiates petty-offense procedures against the egg throwers (source in Hungarian). 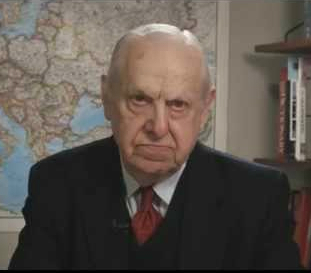 U.S. historian Randolph Braham: returned his Hungarian state award in protest. The Prime Minister’s Office decided in January 2014 to build the memorial in an expedited procedure by the 70th anniversary of the 1944 German invasion of Hungary on March 19. Prime Minister Viktor Orbán and Prime Ministry chief János Lázár presumably intended the memorial to serve as a means of arousing pro-Fidesz patriotic fervor ahead the National Assembly election in April. 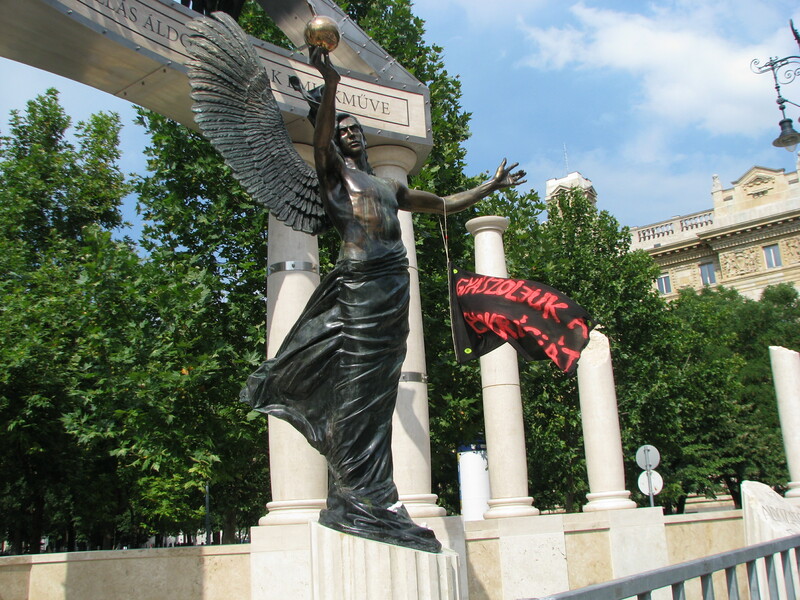 The published design for the statue showed a predatory Imperial Eagle swooping down, talons extended, upon a helpless Archangel Michael, arms spread in resignation, evoking harsh criticism from the liberal-left opposition and Jewish organizations because it implied that Germany, not Hungary, was responsible for the post-invasion deportation of around 430,000 Jewish Hungarians to concentration camps in the Third Reich, almost all of them to Auschwitz. The main Jewish Hungarian organization MAZSIHISZ announced in early February that it would not participate in any official state commemorations of the 70th anniversary of the deportations, partially as a result of the government’s decision to build the memorial (source in Hungarian). Furthermore, the World Jewish Congress and 30 Jewish members of the U.S. Senate and House of Representatives asked the Orbán government to reconsider the planned memorial (source A and B in Hungarian). U.S. historian and 1943–1944 Hungarian Labor Battalion conscript Randolph Braham, one of the leading world specialists on the Hungarian Holocaust, returned the state Order of Merit award the Orbán government presented to him in 2011 to protest the German Occupation Memorial, stating that “I regard this to be a cowardly attempt to divert attention from the role the Horthy régime played in the annihilation of Jews and to obfuscate the Holocaust with the ‘suffering’ that Hungarians incurred as a result of the German occupation, whereas the historical facts prove that rather than resistance, the latter was received with general applause” (source A and B in Hungarian). Taking Horthy for a ride. Prime Minister Orbán responded to international criticism of the proposed German Occupation Memorial during his February 17, 2014 “Appraisal of the Year” (évértékelő) address: “I am still astonished, though I didn’t undertake this profession just yesterday, how they get the nerve to tell us, even expect us, to think, how we should commemorate, what goals we should set, what we should do and what we should not do” (source in Hungarian). However, on February 19 the opposition daily Népszabadság reported, citing unnamed sources, that the government had decided to postpone construction of the German Occupation Memorial until after the April 6 National Assembly elections for two reasons: because unveiling the statue before the elections would be “divisive”; and—perhaps more importantly—because preparation of the various elements of the memorial was behind schedule (source in Hungarian). Although the government never officially announced the postponement, on February 20 the Prime Minister’s Office provided the media with a letter that Prime Minister Orbán had written to MAZSIHISZ stating that due to the election campaign “the time is hardly suitable for us to calmly and compassionately express our opinions to one another” and that they “continue their dialogue after the [post-election] Easter holidays that bring renewal to us all” (source in Hungarian). German Occupation Memorial under construction (photo: Orange Files). 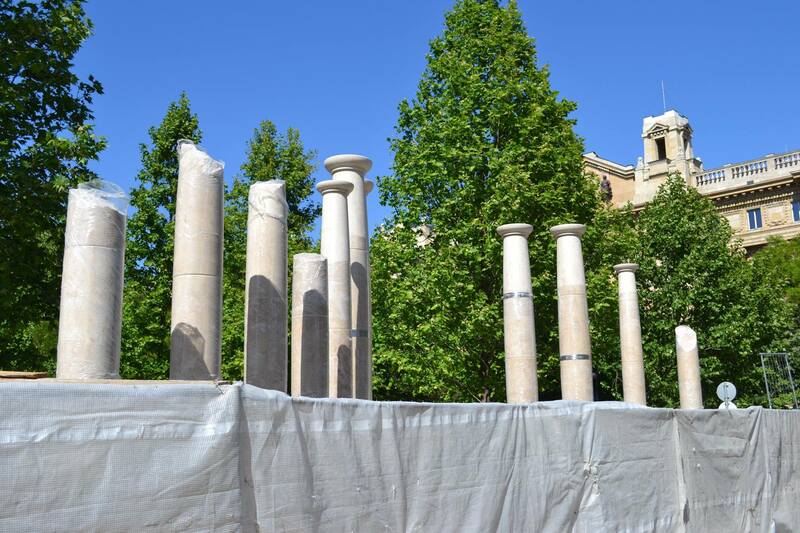 Construction of the German Occupation Memorial began unannounced on April 8, two days after Fidesz won a convincing victory in Hungary’s 2014 National Assembly elections. About 300 protestors appeared at the location of the memorial immediately after the media reported that construction had begun, staging a spontaneous demonstration during which they pulled down a security fence that workers had built around the building site (source A and B in Hungarian). Within days, the area in front of the German Occupation Memorial site was full of mourning stones (which Jews traditionally place at grave sites instead of flowers), records and mementos from the Holocaust, portraits and personal belongings of victims and signs and photographs showing scenes from the deportations and concentration camps as well as evidence of Hungary’s alliance with Nazi Germany (the iconic image of Horthy and Hitler enjoying a mirthful moment while riding together in the backseat of an open automobile in 1938 was especially popular). Orange Files visited the location of the memorial on several occasions over the next three months: each time two or three dozen people, many of them foreigners, stood examining the growing protest shrine and police-protected columns rising above the covered security fence surrounding the work site (see Orange Files photo gallery). Police protecting the newly completed memorial (photo: Orange Files). It was one of the few times that Prime Minister Orbán, the consummate political tactician, had painted himself into a corner: he had vastly underestimated the vehemence of opposition to the German Occupation Memorial and the time it would take to build the structure, thereby nullifying its original purpose of generating nationalist political support in the run-up to the spring elections; and he had vastly overestimated the ability of average Hungarians to understand the intended symbolic message of the memorial portraying Hungary as victim rather than perpetrator during the Second World War, particularly with regard to the Holocaust. In short, it quickly became evident that the German Occupation Memorial entailed many potential political costs and no potential political benefits. The prime minister ostensibly timed the overnight completion of the memorial on July 20 to attract as little attention as possible: not only was the city of Budapest remarkably deserted on that date, many of its residents either on vacation or at their summer homes along Lake Balaton for the weekend; but the shooting down of Malaysia Airlines Flight 17 over eastern Ukraine and the Israeli invasion of the Gaza Strip were consuming the interest of both the residents of Budapest and people throughout Europe and North America (source in Hungarian). The Orbán government reportedly intended to hold an unveiling ceremony on July 21, though cancelled the event at the after the scheduled speaker, Prime Minister’s Office State Secretary László L. Simon, backed out at the last moment (source in Hungarian). Prime Ministry chief János Lázár announced on this date that there would be no official unveiling ceremony (source in Hungarian). Yesterday the Hungarian government fulfilled its obligation to the constitutional order, to past victims and to Hungarians living today. We put the work of public art into place, one that is designed to express the pain and affliction that the Hungarian nation felt and suffered as a result of the loss of its freedom. The newly built German Occupation Memorial has been the site of all-day peaceful protest activity and public discussion over the five days since its completion, much of it organized by the Facebook group Living Memorial (Eleven Emlékmű). Most of those present at the memorial appear to be either Budapest Jews or foreign tourists. However, the German Occupation Memorial could quickly become a rallying point for the Hungary’s growing democratic opposition, Jewish and non-Jewish alike. An early indication: on July 25, a protestor suspended a banner reading “We Mourn Democracy” from one of the arms of the statue of Archangel Michael. More than a day later, police guarding the memorial had still not taken it down. We Mourn Democracy (photo: Orange Files). 12-Refers to attorney György Magyar’s assertion that Gypsies have the right to launch legal proceedings against Gyula Court of Justice Judge Dr. Erika Mucsi for allegedly racist statements she made about Gypsies in the court’s March 24, 2014 decision not to dissolve the radical-nationalist For a Better Future Self-Defense organization on charges that it has intimated the Gypsy populations of several communities in rural Hungary. 13- Alleged statement from Hungary’s Ambassador to Algeria Csaba Mohi regarding how police in Algiers would respond to trespassing at the site of the city’s Monument des Martyrs in reference to protesters having pulled down a cordon around the controversial memorial to the 1944 German occupation of Hungary under construction in Budapest (see What Is Truth?). 14-Reference to the police removal on April 29 of demonstrators from the site at which the German Occupation Memorial is being built in Budapest. 17-Reference to initiation of legal proceedings against demonstrators whom police carried away from the site of the German Occupation Memorial in Budapest. Proposed design for the 1944 German-occupation memorial on Szabadság Square in Budapest. An official from the fifth district of Budapest recently (January 19) revealed the design for a memorial commemorating the German occupation of Hungary on March 19, 1944 to be unveiled in the district on the 70th anniversary of the invasion this spring (source in Hungarian). 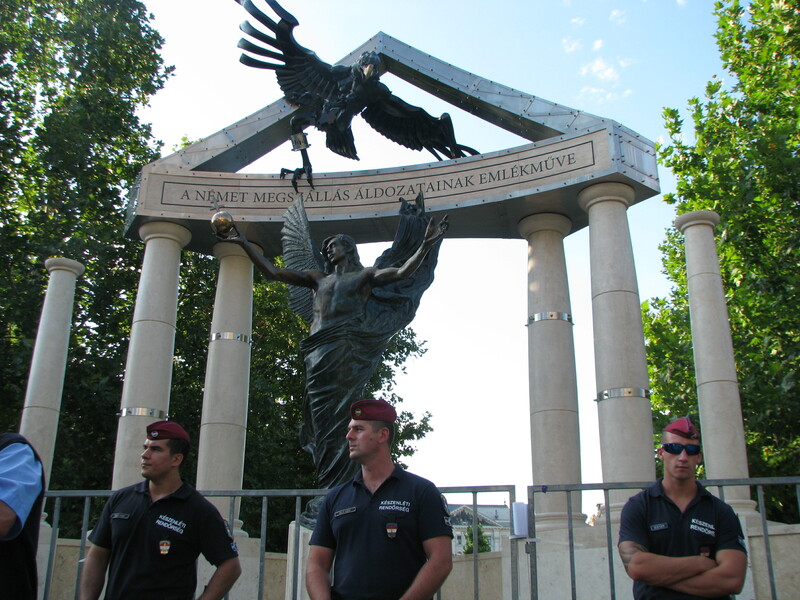 The planned memorial shows an eagle representing Germany (the Reichsadler, or Imperial Eagle) swooping down upon a helpless, open-armed Archangel Gabriel, who represents Hungary (source in Hungarian). The memorial embodies the declaration in the preamble to the Fundamental Law that came into effect in 2012 stating that Hungary lost its independence on the date of the German invasion (and did not regain it until the first post-communist democratic elections in 1990). The implication of this declaration in the Fundamental Law and the symbolism of the memorial: Germany, not Hungary, was responsible for the deportation of some 430,000 Jews to concentration camps (nearly all of them to Auschwitz), between May and July of 1944. It is true that under pro-Anglo-American Prime Minister Miklós Kállay, Hungary rejected Nazi Germany’s request to deport Jews from the country beginning in 1942. It is true that Hungary would likely not have deported Jews had the German occupation not taken place. However, it is also true that Hungary did not resist the German invasion in March 1944—though vigorously resisted the Soviet invasion of the country that began six months later. 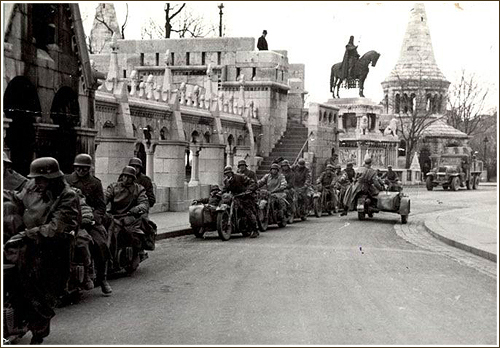 German motorcycle unit at the Fisherman’s Bastion in Budapest following the invasion of Hungary in 1944. 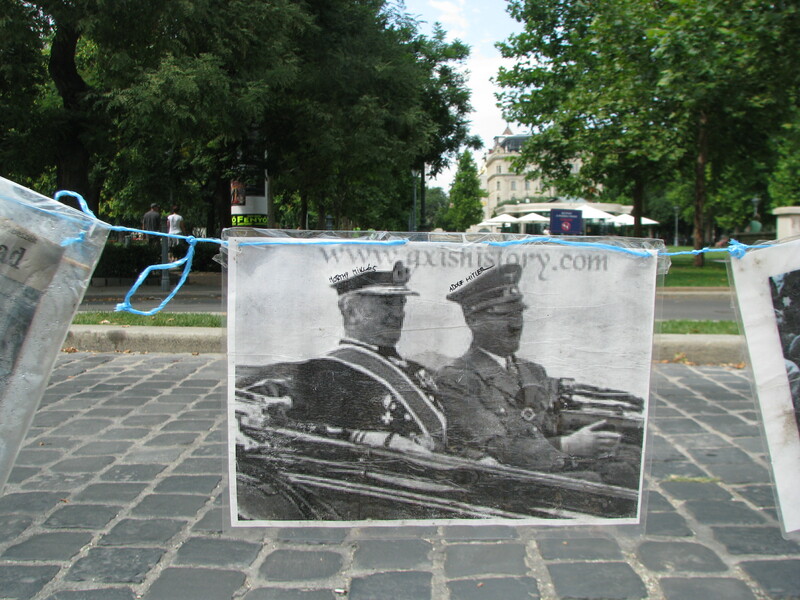 It is also true that Hungary’s leader, Regent Miklós Horthy, remained in power following the German invasion and throughout the subsequent eight-week period of Jewish deportations. Moreover, the Hungarian government under pro-Nazi Prime Minister Döme Sztójay organized the deportations in cooperation with SS Obersturmbannführer Adolf Eichmann, while the Hungarian gendarmerie (csendőrség) carried them out. Hungary’s government had, in fact, adopted three separate laws between 1938 and 1941 limiting the number of Jews who could work in various occupations and fields and banning marriage and sexual relations between Christians and Jews. It also deported 18,000 Jews without Hungarian citizenship (primarily refugees) from Hungary to the German-occupied city of Kamyanets-Podilsky, USSR in August 1941, shortly after the launch of the invasion of the Soviet Union. The Germans executed about 15,000 of these deportees in the first mass murder of Jews during the Second World War. Officials from the main Hungarian Jewish organization, the Alliance of Hungarian Jewish Communities (MAZSIHISZ), voiced objection to the proposed memorial’s message that angelic Hungary was defenseless in the face of the German predator in 1944 and therefore bears no responsibility for the deportation of Jews from the country. 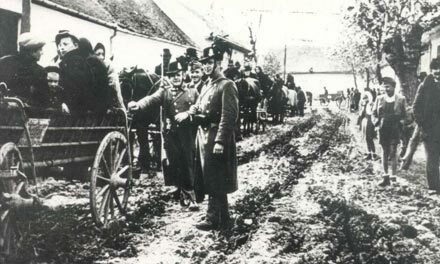 Hungarian gendarmes rounding up rural Jews. In typical fashion, Prime Minister Viktor Orbán’s reaction to these objections was founded upon the false premise that they were based on rejection of the notion of honoring the hundreds of thousands of Hungarian citizens who died as a result of the 1944 German occupation rather than rejection of the notion that the Hungarian government and people played no role in their deaths. Fidesz National Assembly Caucus Chairman Antal Rogán, who also serves as mayor of the fifth district of Budapest where the memorial will be located, deflected objections to the proposed design by suggesting that the beholder is solely responsible for interpretations of its symbolism: “Everybody can read whatever they want to into the symbolism,” he said (source for Rogán and Orbán quotes in Hungarian). 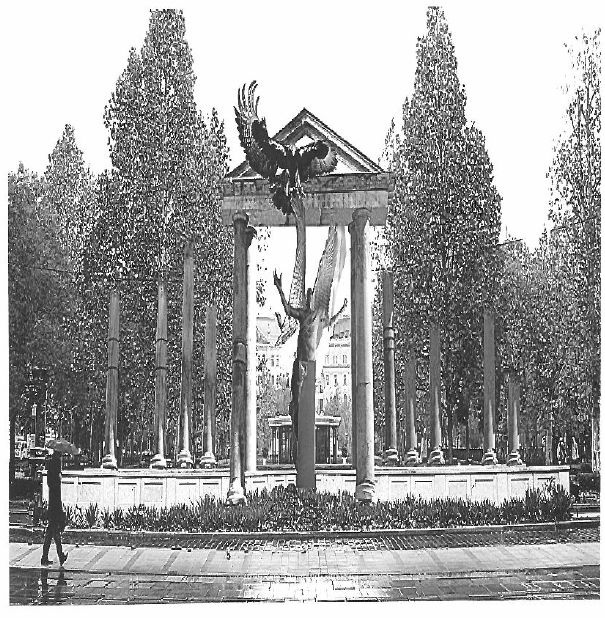 The proposed design of the memorial, which the Prime Ministry commissioned sculptor Péter Párkányi Raab to complete from start to finish in a period of just over ten (!) weeks, has also been subject to harsh criticism on aesthetic grounds. And on financial grounds as well: the government has allocated 318 million forints (1.04 million euros) to build the memorial, of which it will pay 211 million forints (691,000 euros) directly to Péter Párkányi Raab (source in Hungarian). Although the sculptor will obviously have to subtract considerable building costs from this fee, even one-quarter of this sum would amount to 20 years’ pay for the average Hungarian wage earner. The ostensible purpose the new memorial in Budapest commemorating the German military invasion of Hungary in March 1944 is to honor those who died as a result of the Nazi occupation. The real purpose is to absolve the Hungarian government and people of guilt in connection with the mass deportation of Jews to Auschwitz that began two months after the invasion.